Let’s get a few things straight. Detroit, Baltimore, heck, even the entire northeast is not “America”. Throw in a few isolated locations in Arizona, maybe Seattle... still not America. The United States of America includes all 50 states, yes, even those west of the Mississippi. Titled “America Is Under Water, Literally”, today’s post on the Slate weather blog blurs over this reality, and was filled with exaggerated statements. Climate change debate aside (outlier != trend), let’s at least agree on this: America is not under water, literally. It’s true, it rained a LOT this week in some places. Islip, NY recorded a whopping 13.26 inches of rain in 24 hours as of 9:30 this morning. Baltimore and Detroit have also seen record rainfall this week. Warm season rains are spotty in coverage -- depending on where training sets up can greatly determine if records are set. Observation stations will often miss on heaviest precipitation, and vise versa. Rainfall has been less impressive elsewhere. Here are the 24 hour rainfall totals for the U.S. as of this morning. Data is pulled from the NWS Advanced Hydrologic Prediction Service, and visualized by WeatherBell Analytics. No doubt impressive across the mid Atlantic and portions of the northeast. 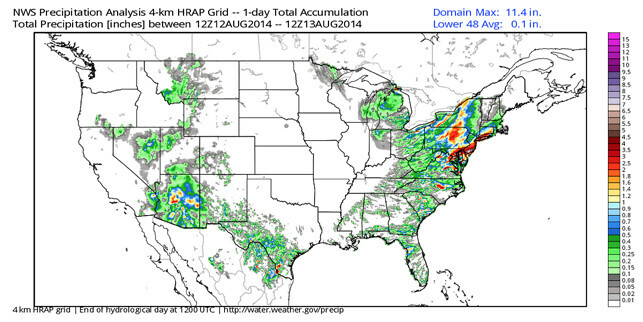 Domain max for the lower 48 during this period was 11.4 inches, with a spatial average of 0.1 inches. The average over the last week for the lower 48? 1.5 inches. 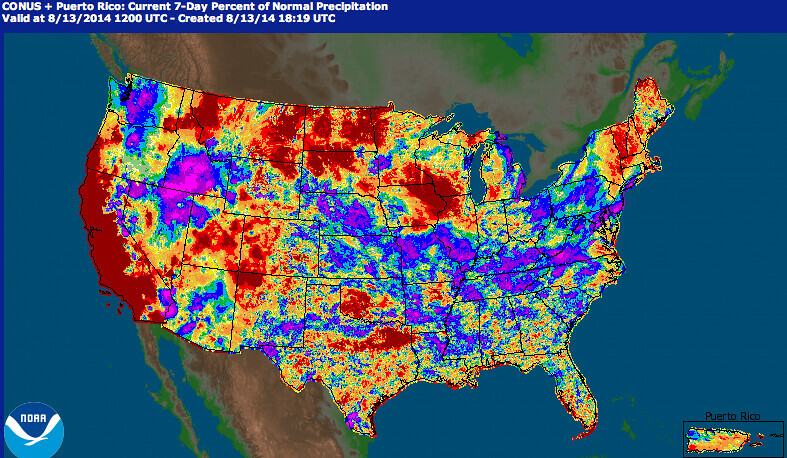 Also of note, monsoonal rains in the west continue to dig into precipitation deficits. Take a look at Arizona in the map above, great news as it’s experiencing its 6th driest year-to-date on record according to the NCDC. No doubt welcome news, not panic. Here are the rainfall totals as a percent of normal over the last seven days across the United States. 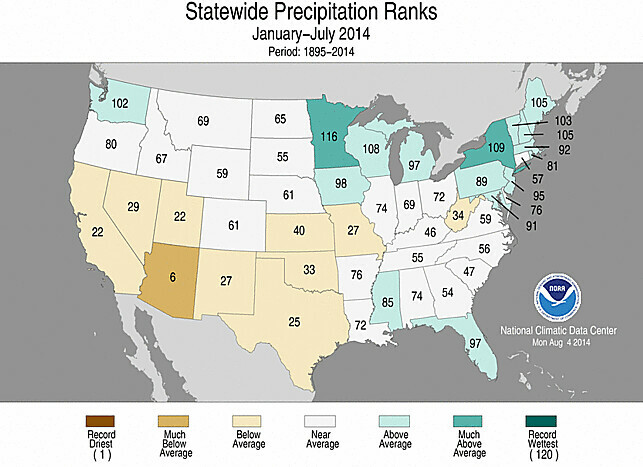 While many locations have seen above normal rainfall, literally not everyone has. Flash flooding events in the are quite typical this time of year, especially when following a period of below normal precipitation in the west. Storms in late July through August tend to move a lot slower than during the late spring and early summer months, and PWAT values are higher too. To pick out a few localized heavy storms in the northwest (with the majority of several states under a Red Flag Warning), tie that into the event in the east, and conclude there are flooding rains everywhere seems irresponsible. 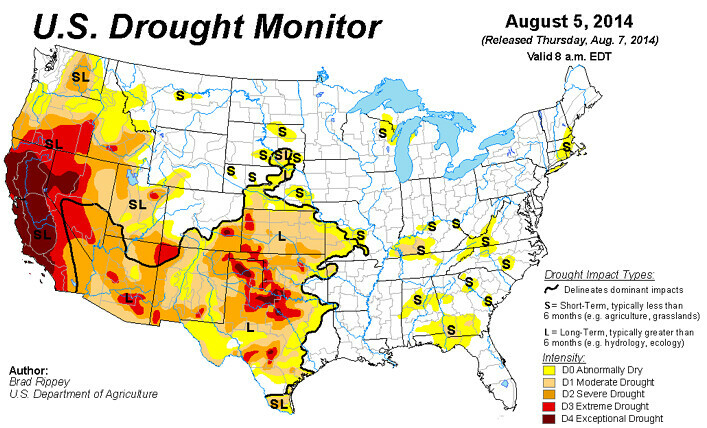 Most of the western United States continues to experience abnormally dry to extreme drought conditions. Ironically, the Capital Weather Gang posted this Tweet just as I got done reading about America being underwater. Keep your head above the water California, drought relief will come.